(30th November 2016) Explore Learning is celebrating after being crowned ‘Private tuition centre operator’ of the year for a third year running in the prestigious EducationInvestor Awards. The company, which provides inspiring English and maths tuition to over 35,000 children within their 123 centres across the UK triumphed over Kumon, Carfax Private Tutors, KSOL 11plus and Regent Learning Centre. Explore Learning was launched in 2000 by Bill Mills, and has grown exponentially in recent years – with centres all over England, Scotland and Wales – as well as five centres based in the US under the name ‘Explore Horizons’. 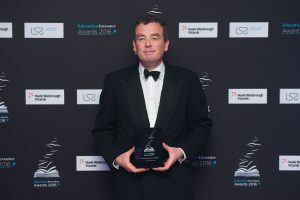 The EducationInvestor Awards celebrate innovation and excellence in the education industry, recognising individuals and organisations that have made an outstanding contribution to the sector during the year. The awards were attended by over 750 of the sector’s leading figures from across the political and commercial spectrum and was this year held at Lancaster London Hotel on Wednesday 16th November. Judges said they selected Explore Learning for their child-centred innovative approach to engaging children which is inclusive for parents with financial difficulties. They also praised them for their “impressive” initiative with the Roald Dahl Marvellous Children’s Charity. The first Explore Learning centre opened in Chelmsford, Essex in 2001. All courses are aligned to the National Curriculum as well as the Scottish Curriculum or Excellence and the Curriculum for Wales. Explore Learning tutors select appropriate resources for each child to ensure they cover a combination of courses, enabling them to reach their full potential at their own pace. Standard membership is £109 per month with a £50 registration fee and members can attend on a drop-in basis. Explore Learning offers a number of helping hand schemes – Childcare vouchers and the childcare element of Working Tax Credits could enable parents to save on their monthly membership, as well as a scholarship scheme with a 50% discount to parents receiving income support or job seekers’ allowance. They also have a very popular ‘refer a friend’ scheme as well as sibling discounts.